Nowadays, tolerance is being marketed in society as a do-it-all word in a pluralistic, multi-ethnic, and multi-religious climate. Intolerance is increasingly unacceptable, and in many cases illegal. Some activists take the issue even farther. For every mention of 'intolerance,' even without the presence of real facts and evidences, people will be up in arms to claim solidarity with the marginalized, the weak, the poor, or the minority. Recently, there is a rather sensational news report about a pregnancy care center in British Columbia. The center provides counsel for pregnant women in crisis. The reporting is a case of an intolerant one-sided reporting against a Christian-based organization that is against abortion. A news reporter disguised herself as pregnant, and acted as if she was lost about not knowing what to do with her baby. Despite signing a standard agreement of services that prohibit any recording material, this journalist recorded the entire session using a hidden camera. Not only was this reporter not pregnant, she broke several ethical principles just to make the whole crisis pregnancy center look bad in public eyes. The end result is a classic case of spin reporting where a less than 5 minutes comment about the dangers of abortion becomes highlighted as if the ENTIRE counsel is about the dangers of abortion. Nothing was said about how the counselor tries to comfort the woman. Nothing was said about the honest desire to connect with the client. Nothing was said about the counselor trying to console, and to understand the predicament of the woman 'in distress.' Instead, the news zooms in on one small segment of the interview and make the small thing the main thing. Not only that, it spins this short phrase over and over again throughout the report, manipulating viewers to believe the interpretation of the news station. Fact is, this report has been conceived by a pro-choice group. The end result is sad. Apart from the negative publicity, the center has been 'punished' by schools that cut all links from this group. Just one biased reporting can unravel all the good the center has ever done. Things typically happen in 3 steps. Do it once, and people will remain skeptical. Do it twice, and minds change. Do it three times, and people start believing. You can read more about the sting operation here. 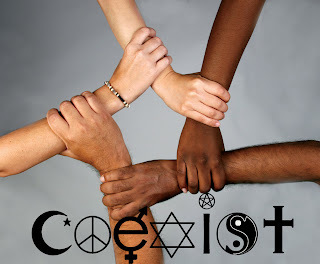 This week, I will write about the climate of tolerance in our modern society. I will argue that true tolerance is not about retreating to a position of "You have your opinions, and I have mine, so let's agree to disagree." Instead, tolerance has three faces. Firstly, it is humble enough to attempt to understand the different positions reasonably. Secondly, it is that conviction to affirm one's faith resolutely. Thirdly, it is the courage to disagree with another person respectfully. Any deficiency in any of these faces will be a deficiency in our practice of tolerance. In reply, Fraser asks Dawkins if he himself can remember the full title of Charles Darwin's seminal work on Darwinism, often championed by atheists in the origin of life. The reply is indeed embarassing for this self-professed champion of atheism. This has become the talk of the town as Dawkins, the champion of atheism cannot even recall the full title of the book that made Darwism famous. Dawkins in dumbing down Christians as a whole, has made himself a laughing stock. Bigotry or intolerance flow many ways. It is not enough to simply talk about it. We must all practise it. Though I disagree with Dawkins's many anti-Christian tirade, I feel that he has been given fair opportunity to present his views. What he is unfairly given is the literally free sphere of publicity and popularity just because he is an atheist. My question is, if the media regularly flaunts and paints Christians as 'intolerant,' why are they not giving fair representation to all parties? Why in the case of the CTV crisis pregnancy session, is the reporter breaking all the normal ethical principles just to gather a tiny bit of evidence and magnify the part to become the whole? Tolerance must occur from all parties. Tolerance means the recognition that all of us are guilty of intolerant behaviour. Even the atheists who attack Christians for imposing their faith, are often guilty of imposing their brand of secularism or atheism on the rest of society. Tolerance require us to give fair representation to all parties concerned. Being tolerant does not mean we compromise our deeply held faith or values. If being tolerant simply means we stop becoming what we claim ourselves to be, it is no longer tolerant. It is hypocrisy. There is a way of being resolute about our faith without diminishing others. Recently, a student organization has been told to stop all campus activities after an unfortunate bulletin that appears to be intolerant and 'offensive.' As the complaints mount, as the media pounce on this unfortunate turn of events, it seems like the rest of society are seeking to exact more than a pound of flesh from the besieged student group. In cases like these, it is normal for people to retreat back into their shells or cocoons. I can imagine hearing the parents of students in the group to retreat and to simply hit their books. After all, Christianity is 'just a religion.' I can even hear prominent leaders trying to score political points by harping on the need for tolerance, while shooting down any accusations of intolerance. In times like these, it is easy for people to just live and let live, and to move back to a neutered position. Discouraged. Dejected. Disillusioned. No. Every failure is but an opportunity to learn about seeking a better way to practice one's faith. There is no shame for apologizing for something not done properly. There is no shame in acknowledging humbly that we can do better. In fact, by standing up for what we believe, we will gain more respect and more credibility for our own positions. John Marks, even after abandoning his evangelical faith, continues to marvel at the convictions of his believing friends. He confesses with a surprising force of conviction. If Christians are so easily discouraged, and distracted by accusations whether true or false, people will start to question their convictions. If Christians honestly believe, let them earnestly stand up for what they believe. Falling down is no shame. It is the failure to get up, or the refusal to stand up for what one believes in, that is downright embarrassing. We live in a world with different beliefs. There is no turning back. Even during the New Testament times, there is a plurality of beliefs. Look at Paul's letter to the Corinthians. Paul is able to understand the culture of his times. Jews are more sensitive to miraculous signs. The Greeks are more open to philosophies, and debates about ideas. It is good to be able to engage Greeks and Jews at their level. This is only the beginning. The Christian needs to learn the contexts in which they live in. There needs to be critical engagement with the world around us, because we are called to be the salt and light of the world. Remember that the greater our witness, the greater the resistance too. That does not mean Christians should start going around calling people names, or denigrating their religions. Christians need to engage actively but to always do so respectfully. One way to do that is to proclaim the faith of Christ. Let the Spirit convict the hearts of hearers that Jesus is the way, the truth and the life. We do the sharing. Let God do the converting. One more thing. Tolerance must never be obtained at the expense of truth. Christians are called to truth claims. Tolerance must always be done in the name of truth. We need to speak the truth in love. We need to proclaim the truth at all times. We are to be truth tellers, speaking in love, in earnest, and in honesty. Let me close with this wise words of a missionary regarding cross cultural work. "Cross-cultural reality testing forces people to examine both their own and others’ understandings of reality. Most people simply assume that the way they look at things is the way things really are, and judge other cultures’ views of reality before understanding them. These judgments are based on ethnocentrism, which closes the door to further understanding and communication. Furthermore, ethnocentric judgments keep missionaries from examining their own beliefs and values to determine which of them are based on biblical foundations and which on their cultural beliefs.” (Paul G. Hiebert, R. Daniel Shaw, and Tite Tienou. Understanding Folk Religion. Grand Rapids, MI: Baker Books, 1999, p27)"
Thought: Conversation is our job. Conversion is God's.